Avoiding goose down will NOT rid your home of dust mites! 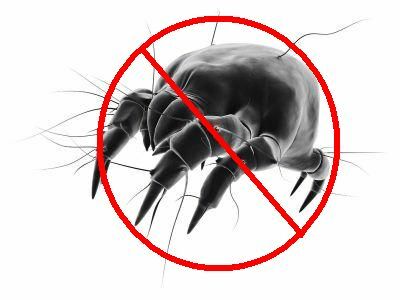 Whether or not you live with the luxury of goose down dust mites will make themselves at home if given the right environment. Mites do NOT feed on feathers or down . Unlike polyester feathers and down are breathable and do NOT trap perspiration. Both Canadian and American Down Association certified goose down have undergone a thorough selection and cleaning process to the point of sterilizing the feathers . Down proof bedding fabrics are constructed with high thread count fabric to control feather loss and acts as a barrier against dust and mites . To get a better understanding of what goose allergies are all	about go to the the following article. Goose Down & Feather	Allergies Information. Bed bugs and Dust Mites are often confused, and understandably so, but they are actually very different. Bed bugs are a 6 legged parasite with antennae -- Dust mites have eight legs like spiders and have no antennae. Bed bugs can easily been seen to the naked eye but dust mites are smaller and feed on dead skin rather than blood. You are probably suffering from an allergic reaction to dust mites! If you are feeling itchy and have actual bug bites, bed bugs might be to blame. If you find bed bugs or the red blood spots they leave behind consider purchasing a new bed set. Bed bugs breed fast and although easily preventable can be very difficult, if not nearly impossible to eliminate. Check out this video we found on You Tube of about bed bugs...Yikes! The best thing you can do for your health where your bedding is concerned is to protect it with encasements. This will keep your bed protected from dust mites because your mattress, pillows, duvets, and feather beds will remain much cleaner. They will be protected from accidents and spills, your sweat and dead skin will stay away from the actually bedding and are understandably much easier to clean! Shower	and exfoliate daily before bed. Cover	you mattress and bedding with protective covers. Even the	inexpensive vinyl covers will do the trick. Open	windows often to air out rooms. Control	humidity between 40 – 50 % with a dehumidifier or air	conditioner. Clean	linens weekly at a temperature of more th an 5 5	degrees celcius (130 F) --Dry	cleaning will not kill mites. Sort clutter in	the room to make it easy to clean. Use	blinds instead of drapes for your windows. Keep	stuffed toys to a minimum and off the bed. Remove	carpeting from the bedrooms. Inspect	hotel beds and keep your clothes off the bed & floors. When	returning from travels launder all you clothing. If you are looking to have your bedding cleaned rather than purchasing a new mattress set Hygienitech.com has a state of the art dry system to clean and rid your mattress of dust mites! Return from this Goose Down Dust Mites page to the Down Bedding Delights home page.